Pop Rocks is a guitar sound pack full of groove, punch, and excitement for you to build your next hit with. It is a ‘no-brainer’ deal priced at $19 right now. A fun sound pack that rocks out pop-infused acoustic and electric guitar goodness. Full of groove, punch, and excitement, it’s a set of power tools to add to your writing arsenal. Pop Rocks packs 12 pop styles, 68 presets, and 84 strumming patterns playable with your own chord progressions. By combining Strum GS-2′s Guitar, Keyboard, and Loop modes along with preset variations, all your guitar parts are covered. Whether it’s a lead sound or doubling takes, the core elements are at your disposal to add character or give a more organic sound to your song arrangement. 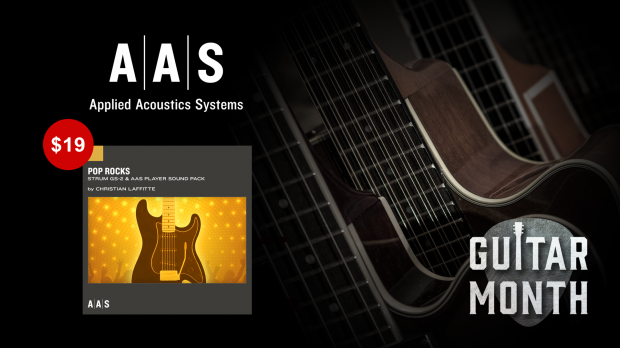 Strums GS-2 becomes your ultimate session guitarist in the studio at the service of your creative mind. Let us hit the charts with you! This entry was posted in DontCrack, Plug-ins, Sounds and tagged AAS, Applied Acoustics Systems, Guitar emulation, Pop Rocks, Strum GS-2 pack. Bookmark the permalink.